First off, get a load of that cover! Man...bodies swept away in a melting city. A pretty woman with a half-sincere expression of fright in a torn dress as a centerpiece. How did her dress get torn? What in the world is she looking at? This cover cracks me up. The title of the book will give you no clues to the questions I pose. This ends my four-volume tour LRH's pulp writings from my local library. The previous ones I read were unremarkable but representative examples of the types of stories that appeared in pre-WWII pulp magazines. The previous ones I read were full of square-jawed tough guys and lots of action and, unfortunately, also the problematic racial and gender representations that, while being the norm perhaps in the day they were published, are offensive to the modern sensibility. I did find them entertaining, but mostly in a what-the-firetruck sort of way. Like watching B-movies for fun. The little LRH biographies at the end of each volume were also a hoot. After reading those you know that he was kooler than Fonzie. Seriously, though, I find it hard to justify the fanfare of the publisher for some of these stories for the modern audience. Surely they have value for students of pulp stories, but you can't seriously say that a story in which the hero tapes his eyes to pass as a Chinese person (Spy Killer) is a quality read. 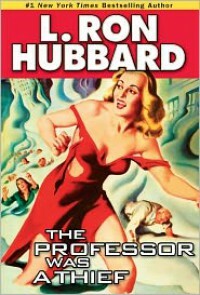 The Professor Was a Thief was not bad though. There are three stories: "The Professor Was a Thief," "Battle of Wizards" and "The Dangerous Dimension." All three are science-fiction. None are masterpieces of the genre, or even particularly good, but they are entertaining and fun, short reads. Thankfully, these are devoid of any uncomfortable racial offensiveness and are fairly lighthearted. These stories in this volume are not by any means classics, but they are fun enough. So it was nice to end my tour on a somewhat positive note, but I don't have much inclination to revisit these collections anytime soon.